Recently, K24 journalist, Betty Kyallo jokingly posted about being mad at her bae but chilled out after receiving cake and flowers from them. However, a fan went ahead and commented on the same: Deep down this lady is hurt… I know what you feel Betty but utakua sawa. Fortunate enough, the TV siren decided enough is enough and that this guy would have a taste of the beauty´s wrath. She did not give it a second thought, rather gave the fan a piece of her mind. My friend cheza ligi yako brathe. One mumo392 went ahead and reiterated the same: @luckydaslive sure cheza kwako uku n juu Time and again, we´ve witnessed fans lash out at the media personality, Betty Kyallo, whether questioning her age, marital status, her ex-lover Dennis Okari or even her weight. But the TV beauty queen decided enough is enough. And if need be, she will discipline fans who seem to be after her every slight move. The comments @bettymuteikyallo be nice koechkane @bettymuteikyallo tell them you don´t suffer and will never suffer from any attachment disorder,_, you have a life yoh! nanzushie  teresamwas  albanuscaxton  felix_kips Fans fully had her back on this! The post Be Warned! 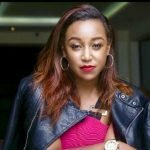 Betty Kyallo claps back at fan with no apologies appeared first on Ghafla! Kenya.